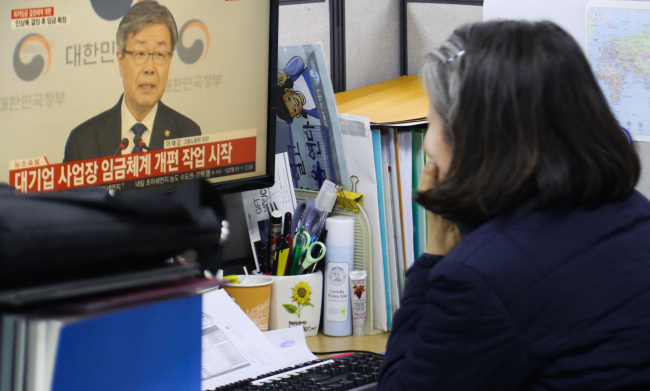 South Korea's mom-and-pop stores on Monday called on the government to reflect their views in revising the minimum wage structure so as to minimize the fallout from rising labor costs. In a press conference held in Seoul, Choi Seung-jae, chairman of the Korea Federation of Micro Enterprise, whose organization represents the interests of micro businesses, stressed that the National Assembly should make the decision on minimum wages. "Experts recommended by the government should not be in charge of readjusting the rate at which the minimum wage will increase, as they are not expected to consider the difficulties higher labor costs are causing for micro businesses," Choi said. The government raised the minimum wage by 16.4 percent to 7,530 won on Jan. 1 last year, the biggest hike in nearly two decades, and plans to increase the wage to 10,000 won by 2020. This year, the minimum wage has risen 10.9 percent to 8,350 won per hour. As the move resulted in job losses for part-time workers and higher financial burden for micro businesses, the government has recently hinted at making adjustments on wage hikes to better reflect the current conditions.